You are here: Home » MEDIA » Books » Class: The Stone House by A.K. Benedict (book review). Class: The Stone House by A.K. Benedict (book review). Tanya is intrigue by the Stone House and she can’t stop going there. You see there’s a girl in the window. You can tell she’s afraid, that she’s trapped and that the house won’t let her go. The house wants more, it wants to show you your nightmares. It makes you vulnerable. She needs her new friends, the disparate band of mismatched aliens and humans to investigate, if they can stop thinking about themselves for five minutes. 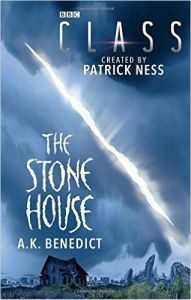 ‘The Stone House’ is one of a short series of novels based on the new BBC3 series ‘Class’. A.K. Benedict has picked up our sunny bunch of characters and woven a clever story around their insecurities and fears. There’s Charlie, the alien, almost the last survivor from his planet (that sounds familiar). Although he now has Matteusz, his onerous responsibility of being the last ruler of his planet weighs on him. Then there’s his bodyguard, Quill, only survivor of the rebels from the same planet and only protecting him because of a creature implanted in her brain that would kill her if she doesn’t. April, well she’s complicated strong and brave with a heart shared with an alien from another dimension. What? Ram is simply suffering. No one should have to go through what he has as a teenager. It’s lucky they have Tanya, at least two years younger, but she feels like an outsider and the group is constantly at war with itself. This is no way to save the world. When they do agree to meet there it’s between the squabbles that the house makes its move. Each of them are touched by destructive and emotional visions. The house is just getting started. It won’t give up its prisoner that easily and maybe it will take a few more. Then there is the website with the reported sightings of faceless Alice. Stories for a gullible social media addicts or a simple truth. The place is haunted. A.K. Benedict has produced a story with a strong contemporary vibe that ties in not only concerns of teenagers but also addresses how society deals with issues. That’s quite a lot for a Science Fiction spin-off novel and it doesn’t interrupt the flow of the story. The various characters are meshed together drawing out their traits, good and bad. The dialogue is witty and believable and there is plenty packed into this short novel. « The OA (trailer: new Netflix scifi series).